It's always interesting when a much-loved pub is taken over. Will this award-winning fancy-pants gastropub with rooms still be up to scratch? Muddy's Kerry Potter investigates (like Hetty Wainthropp but greedier). 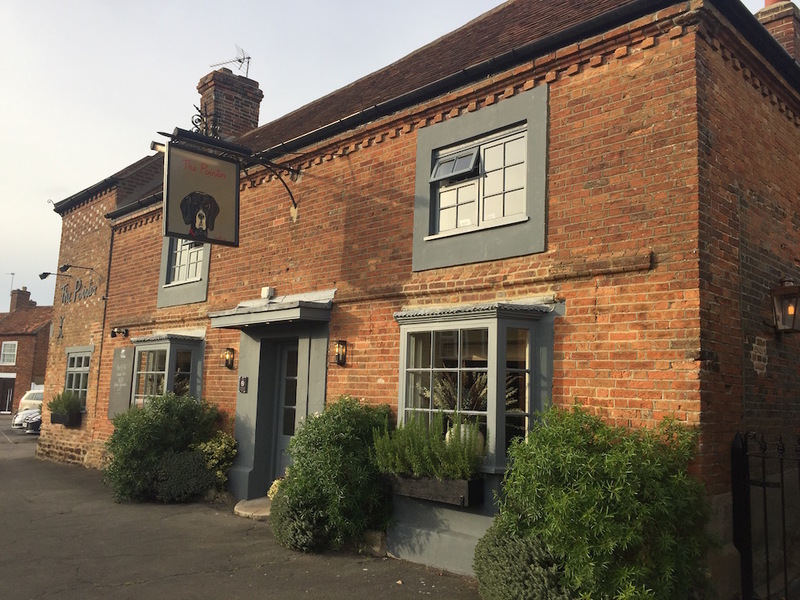 This was my first visit to the diddy Bucks village’s multi award-winning gastropub with rooms since new owners took over last year. At the risk of dropping a massive spoiler on my own review – nothing much has changed. The old guard supplied much of the meat and veg from their nearby farm and the new owners, The Chilton Estate, do exactly the same. Meanwhile most of the staff, including the chef, remain in situ. 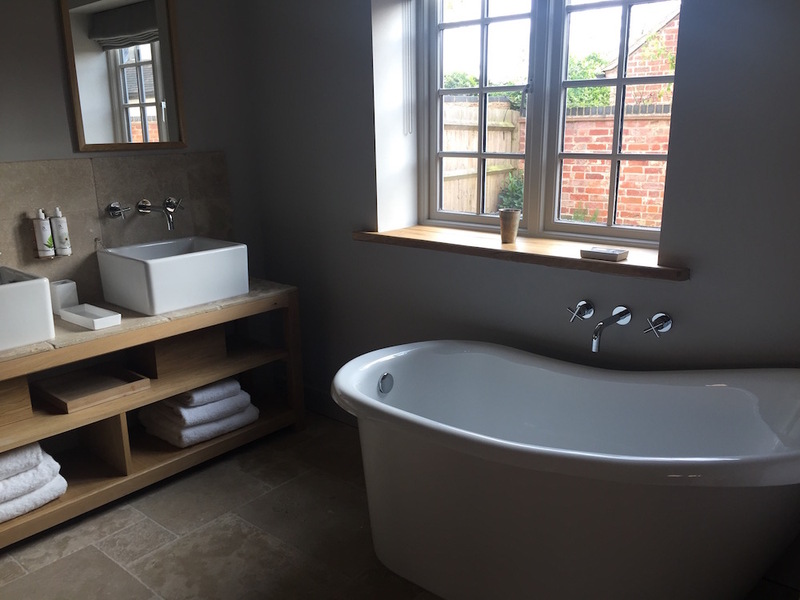 The walls have had a lick of tastefully muted paint and they’re planning to add capacity to the existing four B&B rooms but otherwise it’s business as usual. 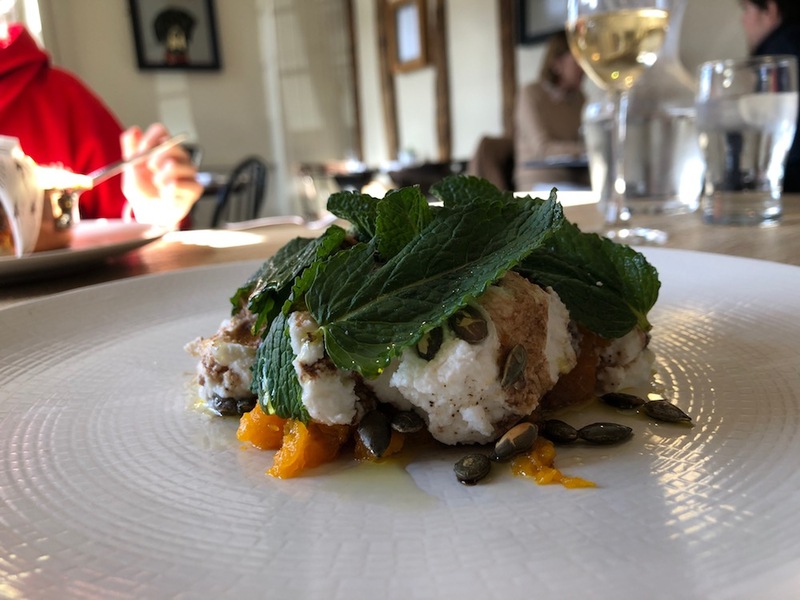 Londoners seeking a rural idyll for the weekend rave about The Pointer – that picture-perfect village with its cute cottages and red telephone box sure helps – but we’ve heard a few murmurs from locals recently about inconsistent food and service. Let’s see, shall we? The 18th century red brick building was filled with an interesting mix of customers when my daughter and I rocked up on a Saturday lunchtime. There was a Chinese family who’d just been on a tour of local private schools, groups of well-heeled Baby Boomers, a smattering of adult children dining with their parents and a gaggle of posh blokes in wellies bellowing by the bar. The Pointer’s new owners are actively trying to be more inclusive of the rest of the village community and to offer greater support to local events. 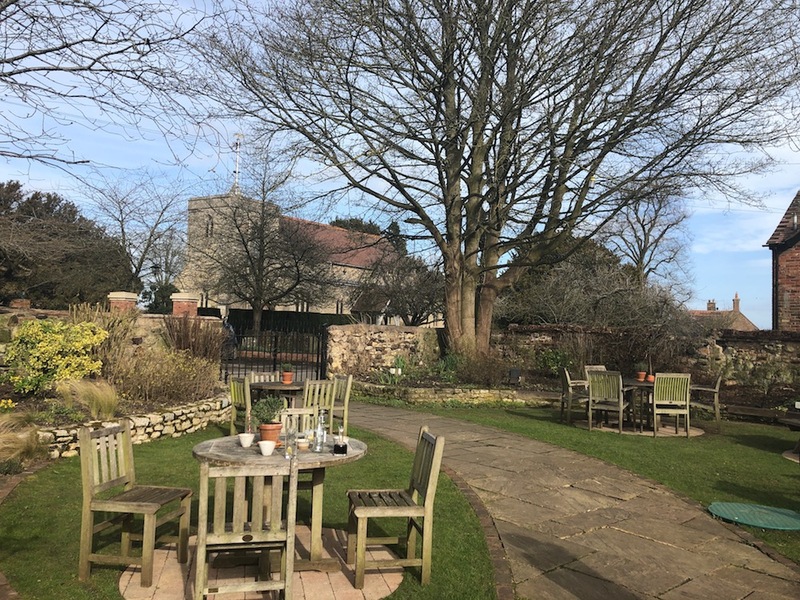 And unlike many gastropubs which are actually solely restaurants, you can happily pop in here for a few drinks, and perch on the sofas in front of an open fires or in the pretty walled garden without feeling like you have to cough up for three courses. I, however, was very much up for three courses. We settled in the bright, buzzy, low-beamed bar but there’s also a dining room back behind the kitchen in a barn conversion. If you’ve got the choice, plump for the bar – you feel more at the centre of things and sunshine streams in at lunchtime. 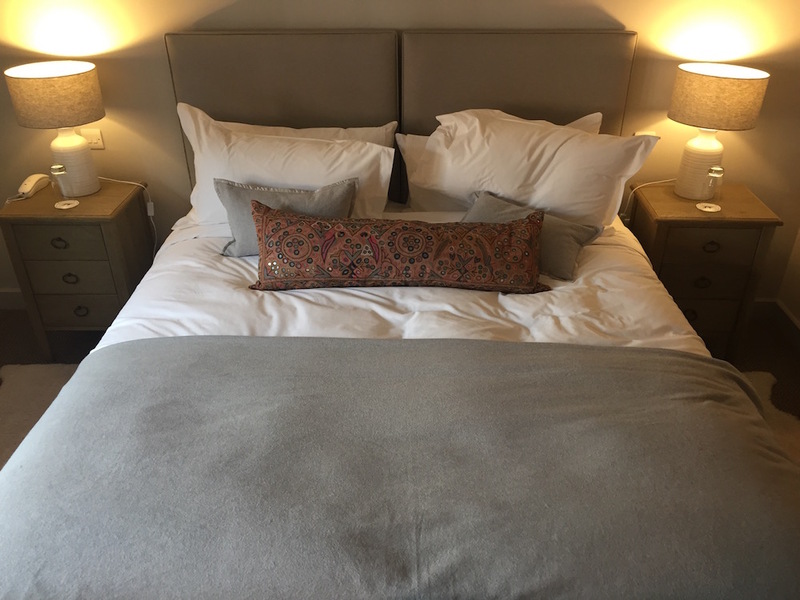 There are four double rooms in the Victorian terraced house across the road and they’re faultless – I stayed a while back and reviewed them here. 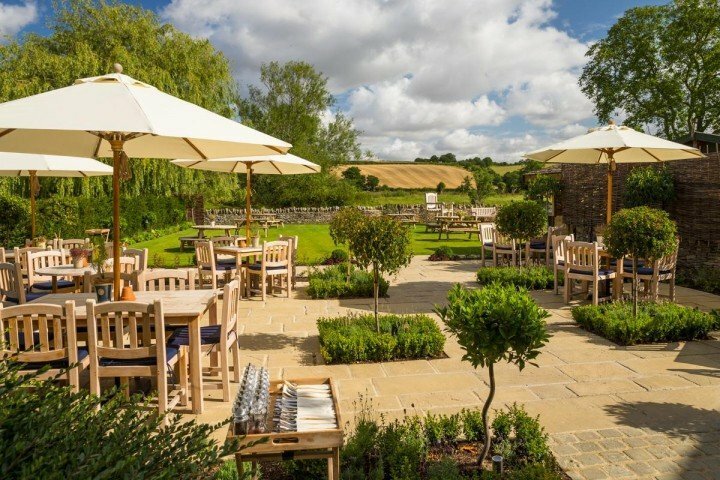 Think boutique hotel rather than your stereotypical Brit B&B. So much so, they nabbed the Sunday Times’ Hotel of the Year in 2017 which may be over-reaching a little (I can’t imagine Claridge’s were thrilled) but, still, they’re pretty darn good. 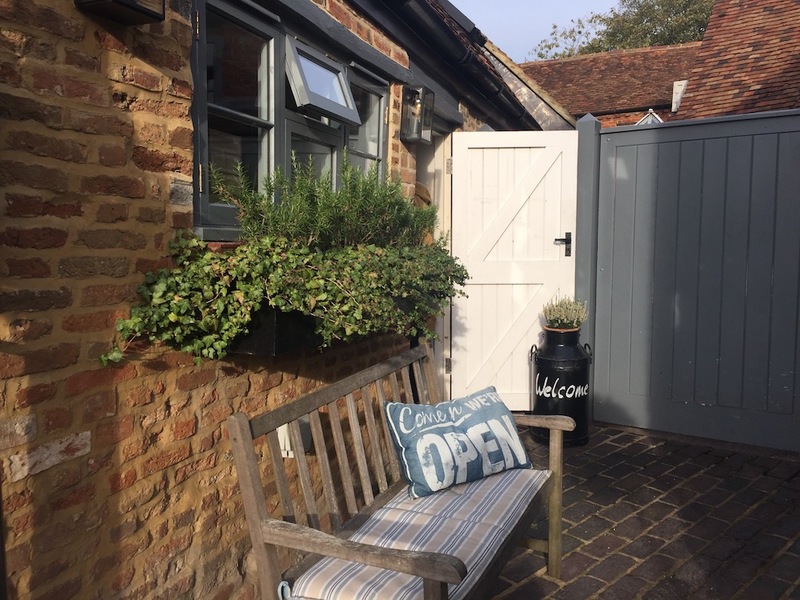 The current owners are in the process of adding four more rooms, this time on the first floor of the pub and they’ve acquired the cottage next door to create a further four. 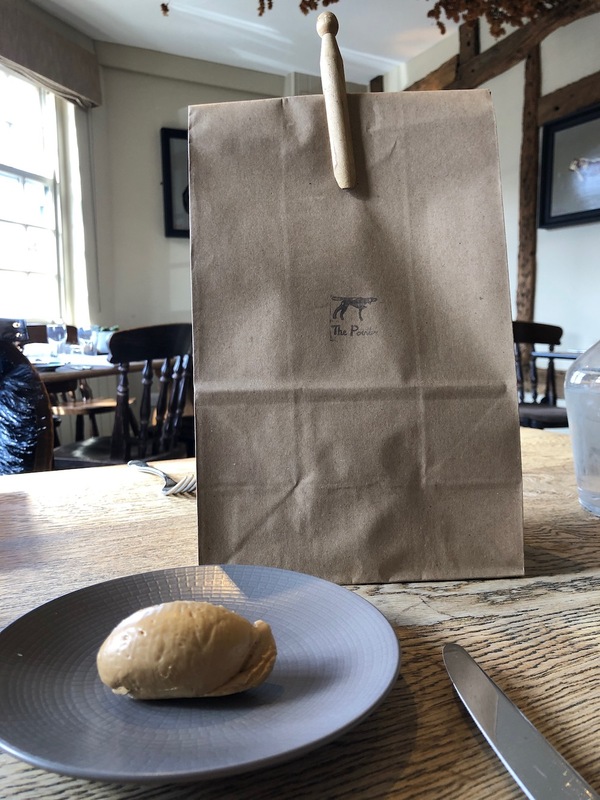 Everything we ate, from the first bite of the homemade bread, served in a brown paper bag with beef dripping butter, to the last crumbs of dessert, was pitch perfect. And the waiting staff were pleasingly knowledgeable about every dish, smiling and patient in the face of my endless questions. I started with a salad of roasted crown prince squash, ricotta and mint, which was flavoursome, fresh and hearty enough to work on a chilly spring day. 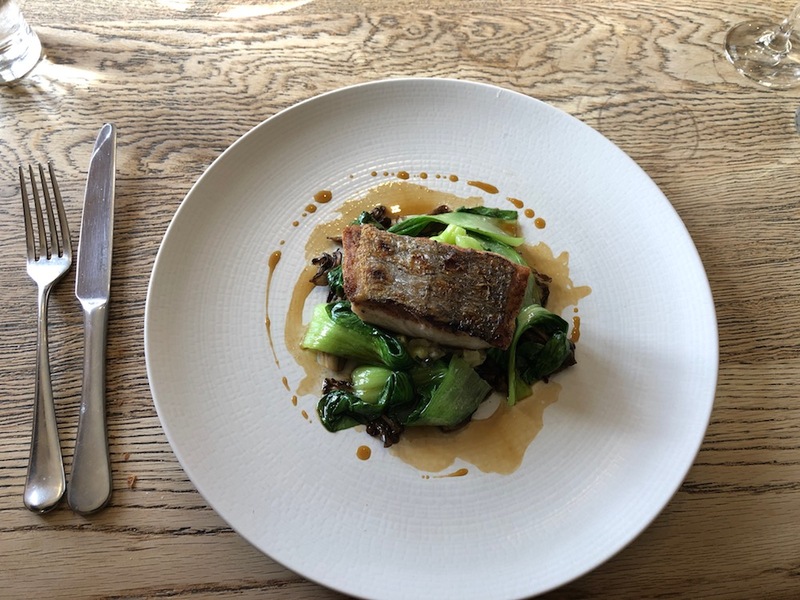 With its farm-to-fork ethos, The Pointer majors on meat (there’s an on-site butchers) but, being a contrary sort, I went for the pan-fried grey mullet, sprouting broccoli, ceps and salsify. It came with a red wine jus which I thought might not work with fish. But, boy, I was wrong. My daughter went for the burger, its accompanying fries served in a pretty copper pan. If you’re going to charge 15 quid for a burger, it better be brilliant and this one was. Other pub classics on the concise menu include fish and chips, and sausages and mash, alongside lashings of meat. Fear not if you’re not a carnivore though, just ask for the vegan menu. Our lovely waiter seemed a little sheepish about its very existence ,but any pub or restaurant worth its Himalayan pink salt would do well to get on board. So many people are ditching meat and dairy it makes sense to cater for them. And the dishes on offer here – sautéed wild mushrooms on toast, leek, courgette and pea risotto – sound lovely, whatever your dietary regime. 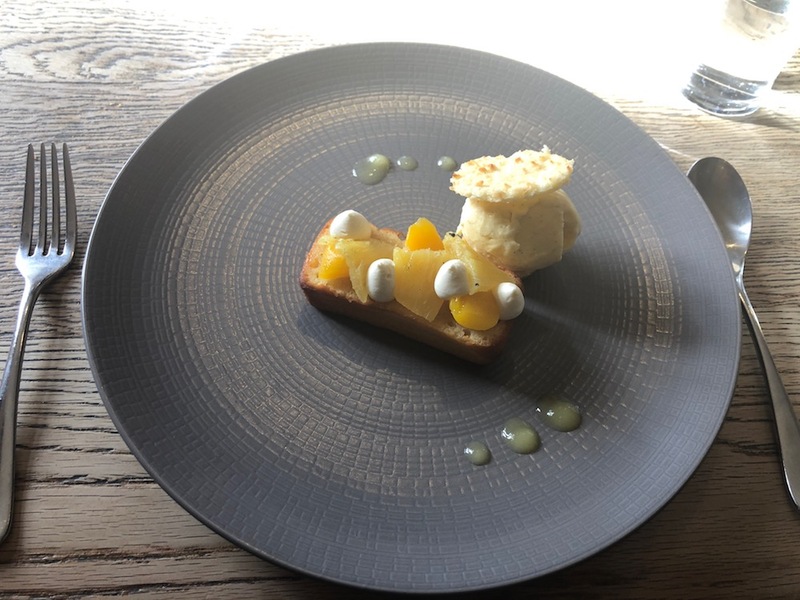 Unfortunately for my waistline, I have no dietary regime to speak of, so I finished by scarfing down the passionfruit cake, poached pineapple, mango, coconut tuile and vanilla ice cream, which was almost too pretty to eat. I said almost. 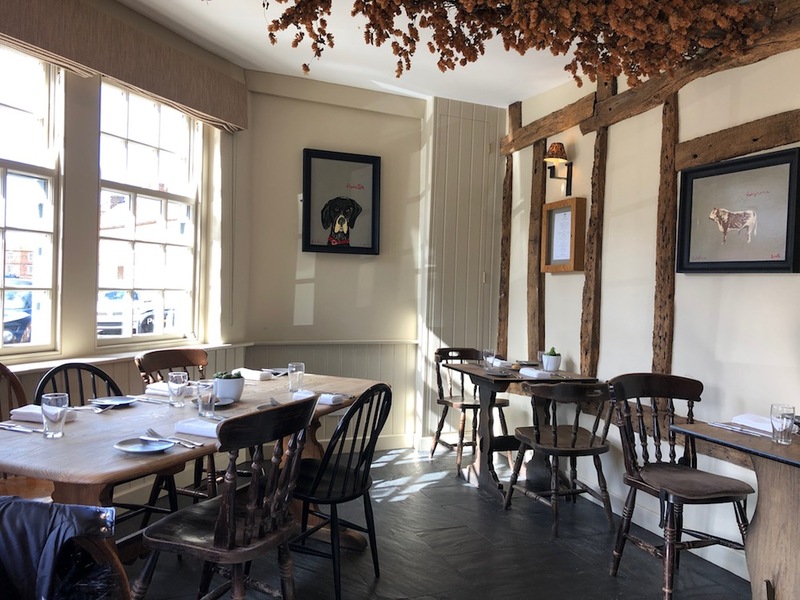 It’s unusual to see a gastropub that takes drinks as seriously as food, but The Pointer has something for all tastes and whims, and champions local producers where possible. From the wine list, which features organic, biodynamic and vegan wines, I chose a chilled glass of Dinton Folly, an English sparkler from just eight miles up the road and about 8,000 times more delicious than Prosecco. There’s also a decent cocktail menu, including a good selection of creative, alcohol-free ‘driver’s drinks’. And this is a hotspot for gin fanatics – the spirit gets its own well-edited menu with choices divided into classic, flavoured, global and guest gins. There’s a short but sweet kids’ menu (under 10s only) with a choice of tomato pasta, sausages and mash or fish and chips, plus ice cream for £8. If you’ve got tiny maniacs who bounce off walls The Pointer might not be your number 1 choice – it’s not a huge space inside or out. That said, they’re about to start extending the garden so there will be more room to play outside. It’s also worth noting, the pub is open every day (apart from Monday) for breakfast and morning coffee – if I was a local parent avec pram, I’d definitely pop in here on a weekday mid-morning for my caffeine fix. Brill common is a five minute stroll post-prandial stroll away and it’s well worth a visit to stomp up and down its many little hills – it used to be quarried for clay, hence the bizarrely undulating landscape. I used to come here as a child and hare up and down the mounds like a lunatic in the summer and sledge down them in the winter. Now I bring my own children here and they do exactly the same, while I take in the glorious views across the fields. 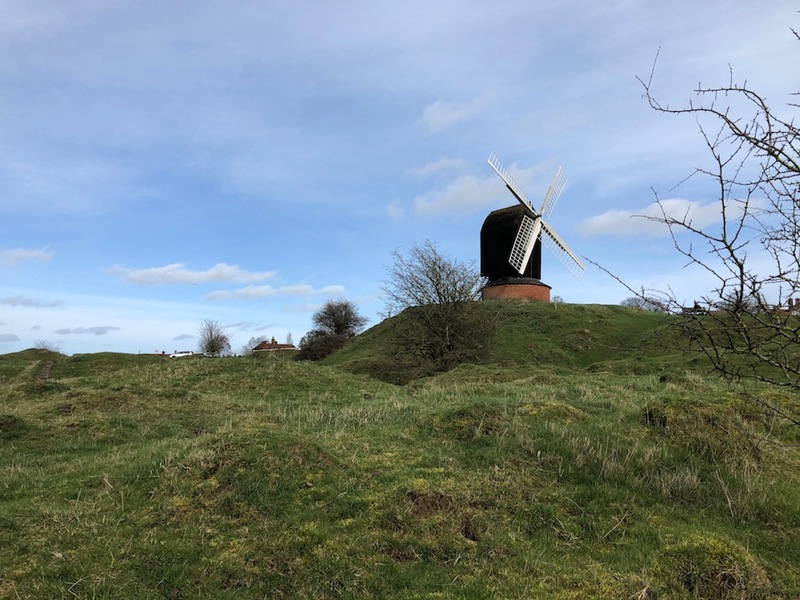 The common is presided over by much-loved local landmark Brill windmill, which is one of the oldest in the country dating back to the 1680s. There’s not much else in the village (although it is extremely photogenic), but Waddesdon Manor is a 20 minute drive, Bicester Village is 15 minutes and the market town of Thame, with its indie shops and walks along the Phoenix Trail, is just 10 minutes down the hill. 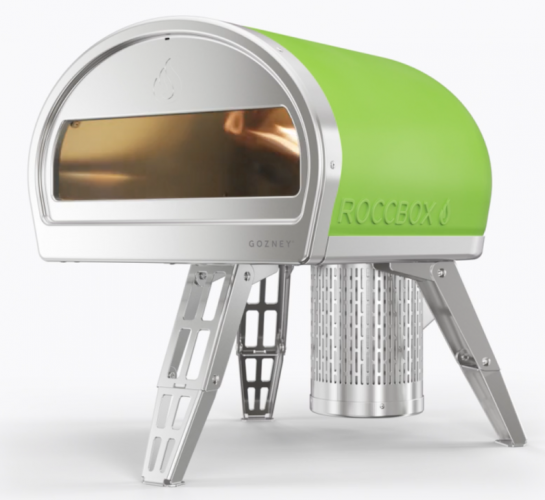 Good for: Family gatherings, lazy lunches or dinners with friends or a few cheeky Sunday afternoon beers in the garden now the weather’s nicer. It also works as a romantic overnighter, with a 10 second stumble across the road to the B&B rooms after dinner. It’s good for dog-walkers too – the bar and rooms are canine-friendly. Not for: If you’re out on the razz with girlfriends, a remote rural location like this is possibly not top of your wish-list. 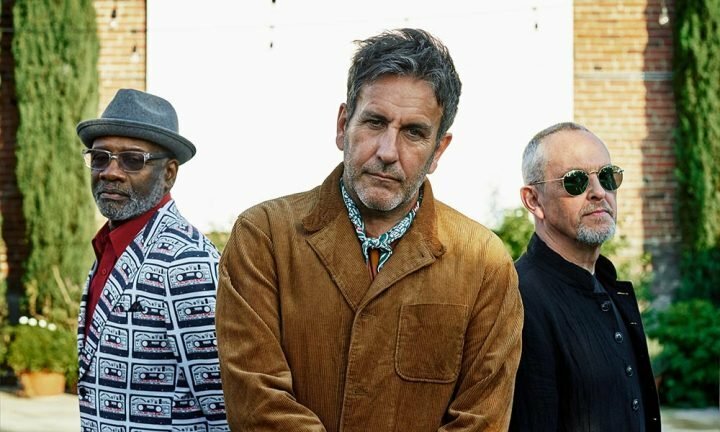 And while the food and service are excellent, we’re not talking white tablecloths and fine dining so if you’re after something very formal, this one’s not for you. 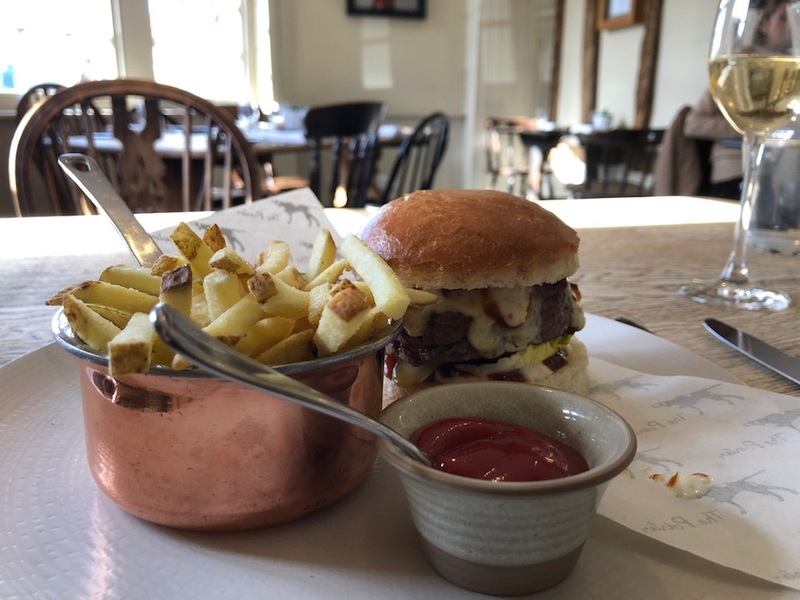 The damage: It’s on the high end for local gastropubs so it’s probably best for a treat rather than every weekend – that said, I don’t think you can argue with the quality of the ingredients or cooking. Starters are around £9, mains range from £15 for a burger to £30 for a steak, and desserts are £8. The children’s menu is good value at £8 for two courses. Double rooms are from £130, the same price they were in 2017. Hungry for more? 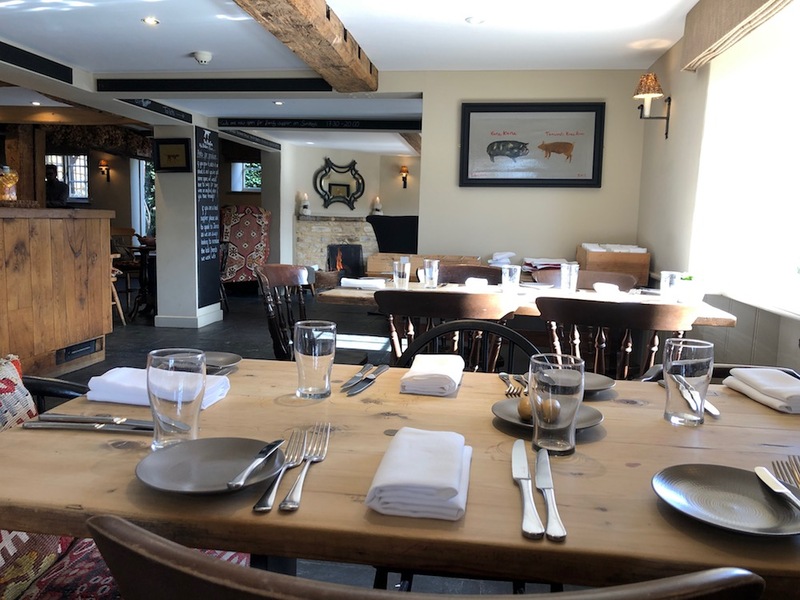 Take a look at our other pub and restaurant reviews here.